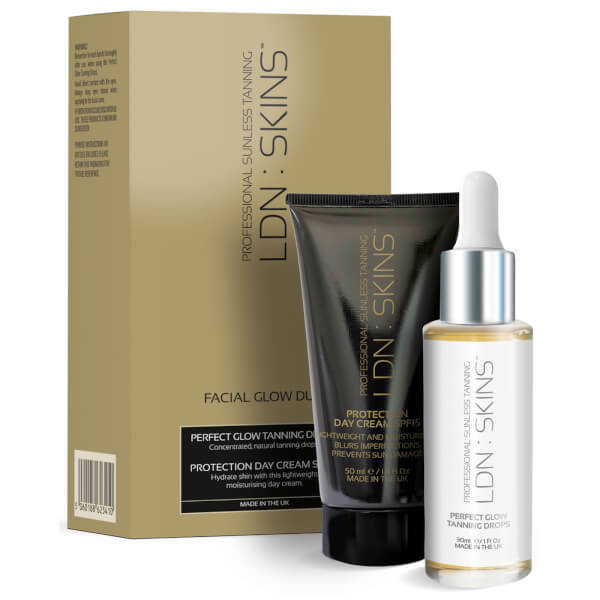 The LDN : SKINS Facial Glow Duo combines a daily moisturiser with concentrated tanning drops to help you achieve a sunkissed glow. Concentrated natural tanning drops specially formulated to be mixed with LDN: SKINS Protection Day Cream. Helping you to achieve and maintain a glowing facial tan, the tanning drops gradually encourage a natural-looking glow while protecting and nourishing the complexion. A lightweight moisturiser that deeply hydrates skin while helping to balance the complexion. Fortified with SPF15, the day cream will keep skin safe from the damaging effects of UV rays. Tanning Drops: Every third day, add between 2-4 drops of the LDN: SKINS Perfect Glow Tanning Drops to the LDN: SKINS Protection Day Cream, blend together in the palm of your hand, and apply evenly to face and neck. This will develop into a subtle glowing facial tan. Always wash hands after use. Day Cream: Apply the LDN: SKINS Protection Day Cream + SPF15 daily. Every third day, add between 2-4 drops of the LDN: SKINS Perfect Glow Tanning Drops to the LDN: SKINS Protection Day Cream, blend together in the palm of your hand, and apply evenly to face and neck. Always wash hands after use. This will develop into a subtle glowing facial tan. Tanning Drops: Aqua, Dihydroxyacetone, Phenoxyethanol, Methylparaben, Propylparaben, 2-Bromo-2-Nitropropane-1, 3-diol, Citric Acid. Day Cream: Aqua (Water), Zinc Oxide, C12- C15 Alkyl Benzoate, Dimethicone, Caprylic/ Capric Triglyceride, Cyclotetrasiloxane, Glycerin, Cetearyl Alcohol, Dimethicone/Vinyl Dimethicone Crosspolymer, Glyceryl Stearate, Cyclopentasiloxane, PEG-100 Stearate, Polyhydroxystearic Acid, Phenoxyethanol, Ribes Nigrum (Blackcurrant) Seed Oil, Isostearic Acid, Polyacrylamide, Parfum (Fragrance), Tocopherol, Silica, C13-14 isoparaffin, Ethylhexylglycerin, Disodium EDTA, Lactic Acid, Linallol, Xanthan Gum, Laureth-7, Biosaccharide Gum-1, Isoceteth-10, Sodium Hyaluronate, Cassia Alata Leaf Extract, Citronellol, Benzyl Salicylate, Farnesol, Limonene.